make your reservations online at https://book.rvspots.com/EstesParkEventsComplex or by calling 970-586-6104. My name is Cheryl Martin and I am your host for the 2019 Championships, Pulling for a Cure. Congratulations to all the handlers and their dogs for a successful season. All the dogs have been working very hard. Great job!!! I have been a member of Region 9 since the early 2000's, when we started pulling our first dog after attending an amateur pull. We currently have four dogs we are pulling. 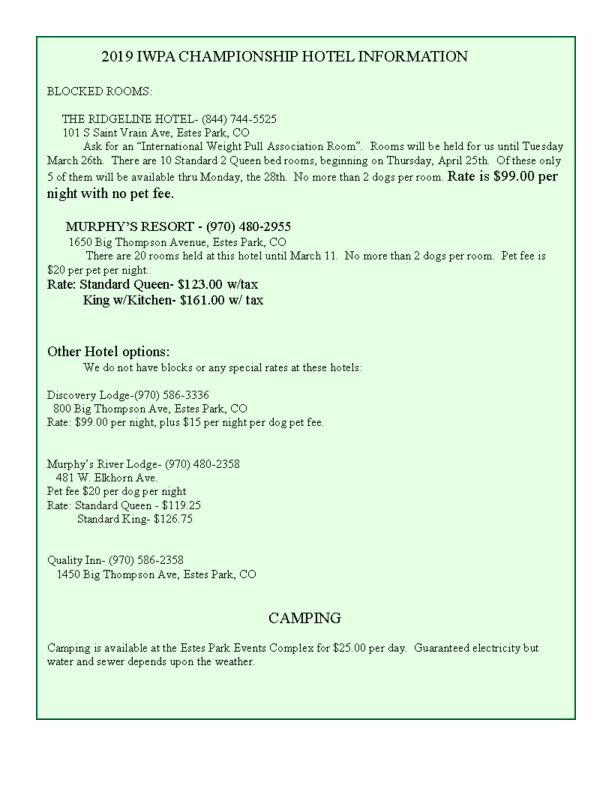 With a great deal of help from our Region 9 members we are hoping that your trip to Estes Park, CO will be memorable. All the events will take place at the Estes Park Events Complex at 1125 Rooftop Way. Registration and weigh in will be held next to the arena under the building overhang. Just follow the signs. Weigh in will be from 1 to 4 pm, with the general membership at 4:30 pm where our weigh in is being held. There will not be a meal with the general membership meeting. 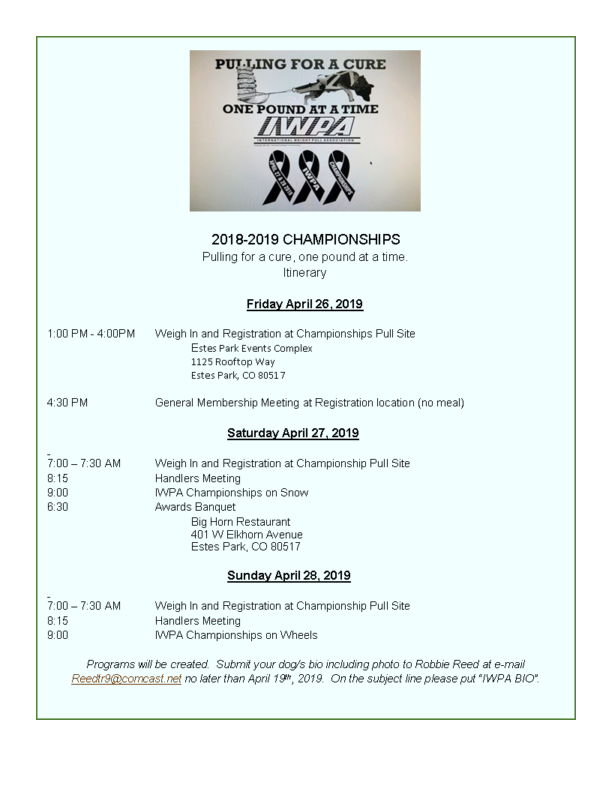 Saturday we will start with weigh in from 7:00 am to 7:30 am, handlers meeting at 8:15 am, and the snow pull will begin at 9:00 am. At 6:30 pm will be our awards banquet at the Big Horn Restaurant, 401 W. Elkhorn Ave.
Our silent auction will be on the picnic tables next to the arena we are pulling in. 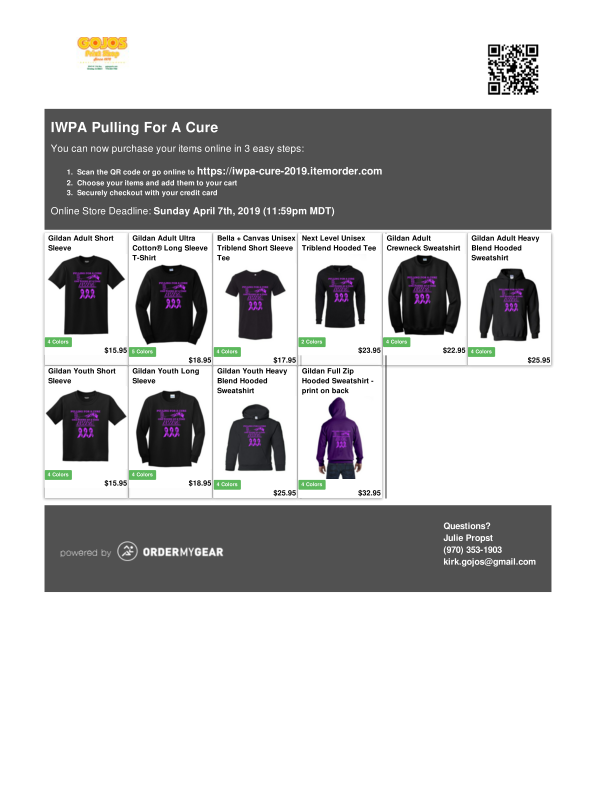 The proceeds will benefit One Cure, an organization researching a cure for cancer in dogs. We welcome all donations for our auction. Thank you in advance for your generosity. The silent auction will end at noon on Sunday. Sunday will be our wheel day. Weigh in will be from 7:00 am to 7:30 am, handlers meeting at 8:15 am, and start at 9:00 am. Get your reservations in for the banquet and don't forget to order your Championship apparel. 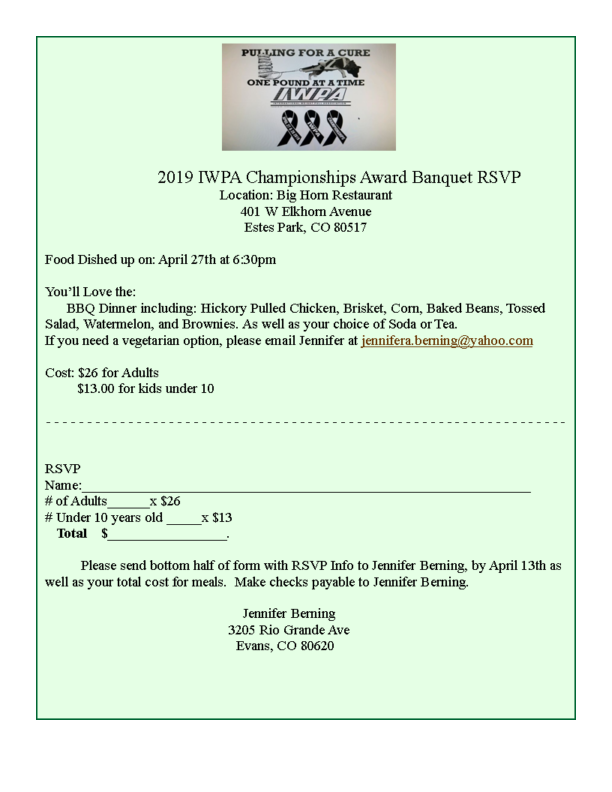 The information for the banquet or apparel is either in the newsletter, on the IWPA website, or the IWPA 2019 Championship Facebook page. We will also be creating a program. Please send your bio for your dog(s) to Robbie Reed @ reedtr9@comcast.net. Please put IWPA Bio in the subject line. Deadline is April 19th. This is the best family reunion you will ever attend. Every year I see "family" we only see once a year and meet new people who soon become part of our continually growing family. Safe travels to everyone and see you in April.